The 242 stick set, in a wooden box, costs $270, which seems good value. 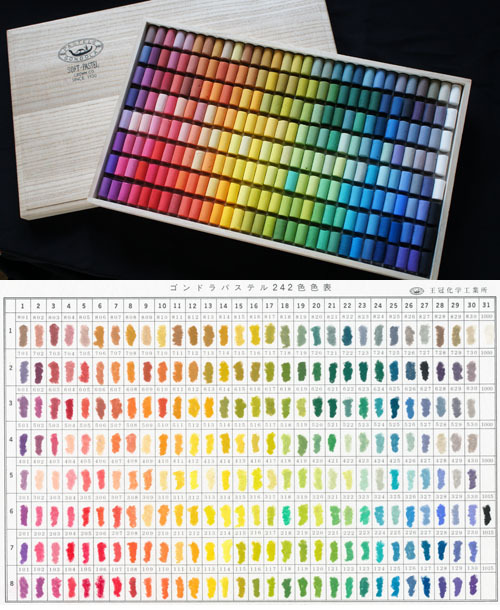 The manufacturer's web page states: Gondola pastel is Japan's first soft pastel manufacturer that started business in Kyoto in 1919. For 90 years since our establishment, we have carefully created the colors according to the light of Japan one by one by hand. In 2011, based on the idea of ​​Takiko Inoue, who received the Kyoto Culture Venture Competition First Prize , he created and launched " Kyoto Seki pastel" which gathered the traditional colors of Kyoto. Bio: Although she graduated from Oklahoma State University with a degree in Psychology, Jude Tolar chose to pursue a career in graphic design and illustration. Pastel is her medium of choice, and she has studied with studied extensively with artists that include Stephanie Birdsall, Lorenzo Chavez, Terri Ford, Rita Kirkman, Terry Ludwig, and Elizabeth Mowry. Jude’s paintings have won many awards, including five Best of Shows and success in the 2011 and 2016 Pastel 100. Her work has been exhibited in invitational group shows and solo shows and is in collections across the USA. Jude demonstrates to art groups and is available to teach pastel workshops. She has written about painting flowers in the April 2016 edition of the Pastel Journal. Jude is a Signature Member of the Pastel Society of America, and the Oklahoma Art Guild. 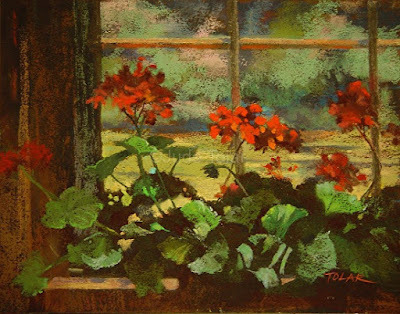 She also holds memberships in the American Impressionist Society, the Oklahoma Pastel Society, the Pastel Society of New Mexico and the Stillwater (OK) Art Guild. Subjects : Floral and tree portraits (outdoors) and glass subjects (indoors). Style: Representational, but with colour as the main focus. Jude prefers to work from life, using mostly Terry Ludwig soft pastels on Art Spectrum ColourFix paper. Navigation: Main menu remains at top of page. This is a new iteration of the FineArtStudioOnline web design. It works very well and is a pleasure to navigate. Gallery: Landscape and Florals; Still Life; Etc. Image View: Thumbnails enlarge in a viewer and may be scrolled. Saving/downloading is possible, and details are provided on medium and dimension. Images are in the main watermarked, but not too obtrusively. Red Geraniums is 11 x 14 ins., 550 x 432, 123 KB.